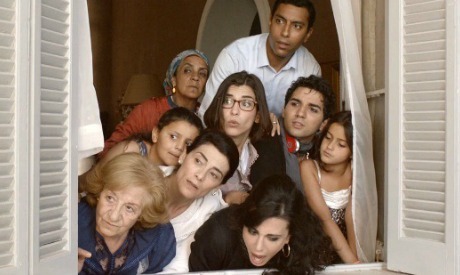 French-Moroccan film Rock the Casbah – currently in its second week of showing at Cairo's art house cinema Zawya – carries a lot of praiseworthy values within its thematic choices, cinematography and performances, but falls short on its predictability and some clichés presented throughout the feature. From the film's opening credits, with the sound track of American song Rock the Casbah, we see Tangier's beach life showing all the contradictions in the society: from foreigners sunbathing, to locals in bikinis, to other locals wearing the veil, and the overall cultural melting pot that is modern day Morocco. This sets the stage for the upcoming social unravelling manifested in the story at hand. The setting of the villa – in which the funeral takes place and the seaside city of Tangiers – aides the director in creating scenes which in spite of revolving around a theme as dark as death, through the picturesque, naturally lit imagery reflect the film's delightful and at times whimsical nature. The film's cinematography incorporates a lot of white colour, which to some viewers might seem as contradictory to the ghastly images of death. This, however, takes us back to the Moroccan culture, where – contrary to many cultures that associate death with black – people dress in colourful traditional dresses, whereas the wife of the deceased is expected to wear white. His youngest daughter Sophia – played by Moroccan-American actress Morjana Alaoui – returns from America with her young half-American son Noah – and immediately her sisters' resentments of her leaving her Arab roots behind surface. Sophia represents the daring spirit of the sisters, who left her father's tight grip to become a Hollywood actress – always typecast in terrorist roles. Her sisters Miriam (Lebanese actress-director Nadine Labaki) and Kenza (Lubna Azabal), chose more traditional paths of marrying from the Moroccan elite and staying under their father's shadow. In their own way, the sisters are stuck in the middle of being traditional versus modern and between their westernised upbringing and eastern roots. Through the story, this cultural question is often brought to the surface through the characters' conversations and arguments about their past and present lives. Rock the Casbah's focus on its female cast brings to the surface many issues and taboos woman face in contemporary Arab society.